TRENTON – It was a day to recognize the brightest and best from New Jersey’s 19 community colleges during the New Jersey Council of County College’s (NJCCC) Phi Theta Kappa (PTK) Day at the Wyndham Garden Hotel in Trenton, when members of the PTK Academic All-Star team were announced. 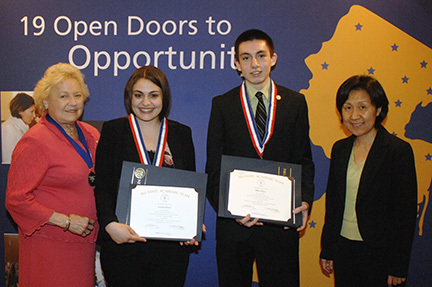 Representing Mercer County Community College was Mike Chica of Bordentown and Lauren Stout of Lawrenceville, selected based on grade point average, outstanding community service, leadership abilities, and recommendations from instructors. "Members of Phi Theta Kappa must meet some pretty strict criteria," said MCCC President Dr. Patricia C. Donohue, noting that a minimum of a 3.5 grade point average is required. "The members of the All-State Academic Team take those responsibilities to the highest level. In addition to maintaining excellent academic records, they are true leaders in their communities." Chica, who received degrees from MCCC in Information Technology and Information Systems from Mercer in January, is currently enrolled at the New Jersey Institute of Technology, where he is majoring in Information Technology with a minor in Information Systems. He credits Mercer with the background he needed to further his education, and encourages future students to pursue every open opportunity. MCCC President Dr. Patricia Donohue (left) and Mercer Phi Theta Kappa Advisor Dr. Jing Huang (right) with students Lauren Stout and Mike Chica during the NJ Council of County Colleges' PTK Day. 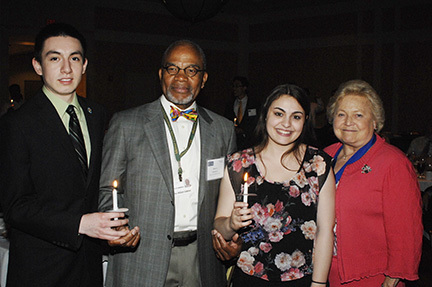 Mercer Academic All Stars Mike Chica (left) and Lauren Stout (second from right) with MCCC Board of Trustees Treasurer William Coleman and President Dr. Patricia Donohue during the PTK candle lighting ceremony. Stout, a Criminal Justice major at Mercer, graduates in May and will attend Rider University in the fall as a Finance major, with the goal of going into federal law enforcement. She credits the instructors at Mercer for her success, and preparing her for the next step in her career.